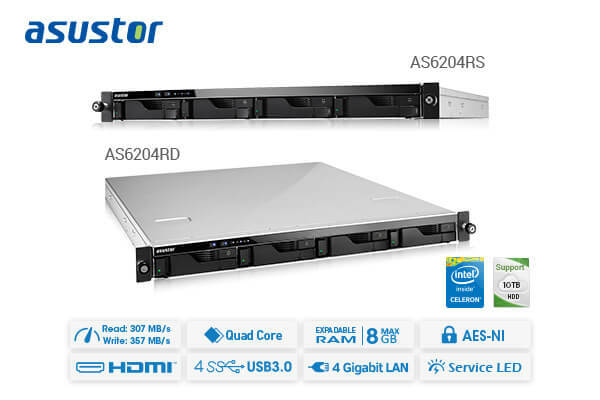 ASUSTOR launches new AS6204RS/AS6204RD rackmount NAS models powered by Intel Braswell quad-core processors and 4 GB SO-DIMM DDR3L memories. These models are equipped with stable performance and a rich variety of functionality such as comprehensive backup and storage services, seamless integration with virtual environments and simplified management for network administrators, creating an optimal enterprise storage solution. Taipei, Taiwan, September 13th, 2016 – ASUSTOR Inc., a leading innovator and provider of network storage solutions, has announced the launch of 2 brand new rackmount NAS models powered by Intel Braswell processors. These 2 new models are the single power supply AS6204RS and dual power supply AS6204RD. Both come with powerful core specifications and a rich variety of expansion interfaces allowing for unparalleled agility and seamless integration in demanding enterprise environments. The 4 high speed Ethernet ports also allow businesses to flexibly deploy network traffic providing stable access performance. Furthermore, the AS6204RS and AS6204RD have passed stringent hard disk compatibility testing, and support the largest hard disks on the market (10TB), allowing businesses to create 40TB high capacity storage spaces. The AS6204 and AS6204RD come built-in with the ADM operating system, which features a simplified graphical user interface that feels intuitive for any first-time user. ADM provides a variety of management tools for enterprise including seamless integration with Windows AD account management, batch account creation and importation, support for Windows ACL 13 types of advanced file permissions, two-way backup with Mission Mode, event notifications, system self-checkup tools and iSCSI snapshots. These tools help to simplify daily system management while increasing productivity. Under RAID 5 configurations, transfer performance on the AS6204RS and AS6204RD is able to approach the maximum throughput of Ethernet with read and write speeds of over 307 MB/s and 357 MB/s (Link Aggregation, iSCSI/RAID 5), providing stable multi-user access and multitasking. Additionally, all data and connections can be protected via a variety of features such as RAID data protection, 256-bit data encryption, firewall, Network Defender, HTTPS connections, 2-step verification mechanism, and antivirus. Newly Added File System Support for MyArchive (EXT4, NTFS, HFS+) Increases Compatibility of MyArchive Disks. App Central App Repository Features Rich Variety of Apps for Multimedia, Business Productivity and More. All ASUSTOR NAS products feature 3-year warranties. For more detailed purchasing information please contact your local ASUSTOR dealer.